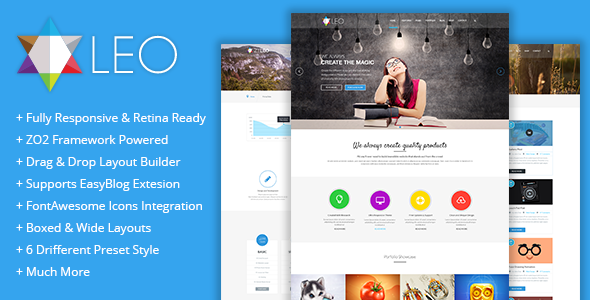 ZT Leo is an responsive Joomla Template. This theme is suitable for multiple purposes websites such as business websites, eCommerce store, unique portfolio, creative designers and photographers. ZT Leo is designed with a variety of colors, attractive layouts and impressive displays of images. Especially, you don’t feel worried about transfiguration of the website because this Joomla template has a responsive web design. Built in a very powerful Zo2 Framework. You can customize your template from head to toe with tons of fonts, different changeable background & preset style, and create new pages for your Joomla site a lot easier with Drag & Drop Layout Builder. When experiencing this template, you will have the opportunity to customize your site in the perfect ways. Even if you only have a limited knowledge of CSS and HTML, you can tweak Zo2 and create an awesome and unique design. Item Reviewed: ZT LEO Intuitive Responsive Joomla Template 9 out of 10 based on 10 ratings. 9 user reviews.